Boris Mordkovich and Anna Mostovetsky thrive on adventure and share an enduring passion for the environment, so when Boris and his brother, Yevgeniy started EVELO, an electric bike company in New York, Boris wanted to find a way to raise awareness about green transportation. After some thought, he and cycle partner Anna Mostovetsky took on one daunting undertaking, deciding to set off on a trans-American electric bike tour. Now two and a half weeks in, the journey is taking the pair from New York City to San Francisco by electric bike, with stops along the way to give talks and test rides to anyone who might be curious about the technology. 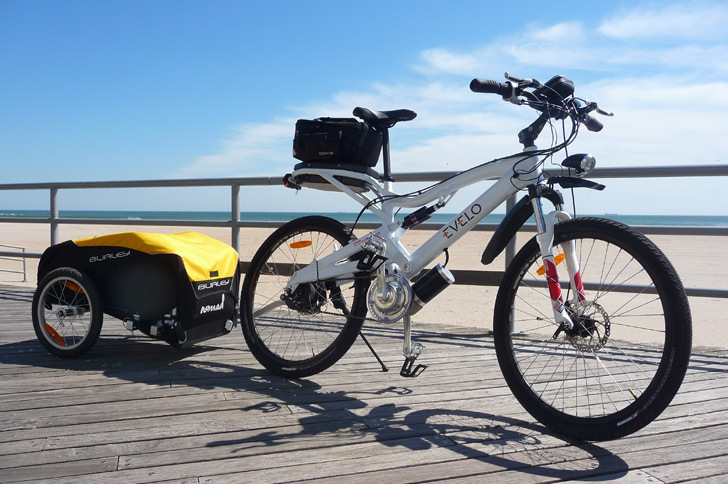 The EVELO electric bikes, Aries and Aurora, are powered by a 250-watt motor and a 36V10Ah lithium battery that allows the duo to travel around 40 miles per charge. With a lot of ground to cover, and at a pace of around 80-100 miles per day, they carry spares to extend their range, and charge the batteries for around 4-6 hours each night in a standard 110v outlet. For a more eco-friendly charging experience, which could be particularly handy if camping, the batteries could also charge up with a small solar charger that can be installed on the trailer. All electrical components on the bikes are fully enclosed and waterproofed, and during times of heavy rainfall they take additional precautions, wrapping the batteries in plastic bags to be absolutely sure they don’t incur damage. 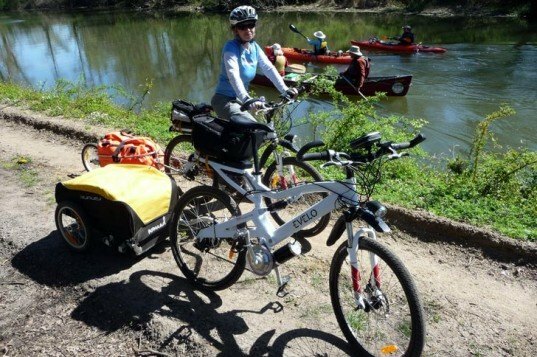 In spite of such moments, Mordkovich describes the electric bikes as a fantastic way to feel and experience ones surroundings, traveling at a steady 15 miles per hour. He admits, that a certain degree of additional determination is needed during moments of the 4,000 mile long trek in which he sees cars covering the same distance in an hour as he does in a day, but those moments pass, as they find quieter, more scenic paths, and meet with curious passers-by on their stops. With electric bikes already popular in Europe, and electric bike sharing operations getting off the ground in cities such as San Francisco, Mordkovich and Mostovetsky hope that their tour will raise interest in the e-bikes throughout other areas of the country. You can follow their tour and see where they will next stop on their website.